Listed in no particular order, (although I did list some of the top sellers first as they do stand out from the crowd) are 40 fullscreen WordPress themes. You can click the links below to jump immediately to that full screen theme. 1. Studio8 – a very bold and visually appealing theme Studio8 is one of the nicest full screen themes I’ve seen. The menu system that minimizes out of sight which is powered by jquery is really nice. This theme also works with well with youtube and vimeo support. The ajax of this theme is something you need to see for yourself. 2. King Size – Fullscreen background slider with 5 gallery types to showcase your work. Custom admin panel with shortcodes and widgets. Over 5,500 copies of this theme have been sold! 3. Core Theme – Full screen slideshow for photo gallery along with built in font manager and 4 portfolio styles. Includes 8 custom widgets and many shortcodes. With over 4,000 copies sold you know people just love this theme. 4. Village Theme - Village includes a bunch of different features really too many to list here. Including drag and drop image uploader, automatic thumbnail creation, video support and of course full screen backgrounds. 5. Contrast Theme – suitable for photographers, graphic and web designers as well as agencies. Includes 120+ shortcodes, widgets, 4 unique portfolio layouts. Select between Color, Image, Flash Video, Google Maps and Slideshow type backgrounds for any post and page easily with pattern options. Apple iPad compatible! 6. Delight Theme – Another theme with lots of features including fullscreen backgrounds. Sidebar generator, Portfolio Galleries with Lightbox, Google maps and more. 7. Invictus – A full sized image and video theme for photographers and creatives alike featured both black and white skins, fullscreen background support, post image sliders, fullscreen flickr slideshows as well as bulk photo uploading. 8. DK Theme – a premium theme built for photography or portfolio websites with the latest WordPress features in mind including custom post types, unlimited colors as well as full screen slideshows. This theme also includes 7 custom widgets. 9. Flashlight – 6 different galleries makes this theme pretty darn impressive Fullscreen, Masonry Grid, Inline Slideshow, Inline Attached, Classic 3 Column, WordPress Default). Supports woocommerce so you can sell your photos with ease along with a bunch of cool features. 10. Full Scene - offers both dark and light skinds, customizable background (fullscreen and normal), customizable secondary colors along with custom @font-face fonts. This theme is very professional and can be used for many different businesses. +30 shorcodes! 11. Adventure – minimal theme with drag and drop ajax slider, 1-4 column galleries, and interactive walls. 12. ANAN – a lovely full screen theme which includes custom post types, color picker, custom fonts and a full screen homepage slideshow. Includes 4 portfolio styles and 8 custom widgets. Includes custom menu support. 14. Chocolate – A clean and elegant theme for displaying your images in a fashionable way. Includes 2 level galleries, fullwidth showcase-style slider for homepage and custom widgets. Standout feature is it’s tumblr style post types. It also has a masonry gallery. 15. Mediareel – fullscreen slideshows, portfolio custom types, color picker and unlimited sidebars. Includes 3 custom widgets and choose your own logo. 16. Panarama – Paginated background sliders in posts, fullscreen galleries, exif data, background pattern options, MP3 player integrated, custom menus and sliding menus. Of course google analytics and web fonts are there. 17. Picture this – If fullscreen is what you want then Picture this will deliver. Fullscreen background image slideshows for each post/page/portfolio. Includes custom color picker, logo options, text colors, etc. Over 1,600 copies sold! 18. Viewfinder – Minimal design with valid HTML make this theme very pristine. 2 color variations light and dark with optional exif data display. Extensive theme options are all unbranded for your pleasure. 19. Alive – Unlike most full screen themes that stick to the same layout Alive actually breaks out of that mold to create a custom feel which is perfect for many situations. Includes dynamic navigation menu, full screen background slideshow and AJAX features. 20. Apolo – full screen image and videos with HTML5 support. 40+ cufon fonts, youtube and video support as well as 30+ shortcodes. Includes ajax contact form. 21. Architechtos – Tired of standard thumbnail grid layouts? Then Architectos offers something different in the way of a loose and open layout. Comes with a visual drag and drop interface. Architectos also supports videos. 22. Artboard – jQuery fullscreen slider and tested with all major browsers. Includes font replacement and is ipad/iphone/mobile friendly. The front page is responsive. 23. Fullscreen template – touch screen ready! This theme features some tasty animation effects when you first load it so be sure to check it out. Comes in two different color schemes with custom built background image slider with two special effects you have to see. 24. Her – ER is a powerful, premium fullscreen background WordPress theme great for photography and portfolio websites but can also be used for other projects. Fullscreen Background Image Slideshow and Use Background Music on any page/post/portfolio item you want! 25. JR – Custom shortcodes, page templates, contact form and blog pages make JR pretty impressive. Works with WordPress 3.3 and includes social networking functions. 26. Mass – Includes 13 layouts that are AJAX and crawlable which is important for SEO. Includes an impressive Facebook comment integration as well as custom post types and the masonry jQuery plugin. 27. Meshable – Both image and video support for fullscreen, audio player, ajax galleries, spam protection, shortcode generator and more. 28. Pacifico – boasts many features like gallery slider management, SEO features, form builder and more. 8 Theme Skins, 3 Layouts, 25 styled widgets, 35+ styled shortcodes, Google fonts (422 fonts so far) and Multisite support. 29. Photolux – a powerful and elegant photography and portfolio based theme that features both dark and light skins. The ajax gallery and awesome jQuery animations makes this theme very dynamic. Cufon and Google fonts supported. 30. Photorific – offers full screen image slideshows, color matching, shortcodes, widgets for flickr photos as well as offers portfolio section with video support. Includes ability to create unlimited sidebars. 31. Photox – Built on a solid HTML5 WordPress framework, Photox is an impressive and minimal full screen background theme. This theme also includes well thoughtout SEO features. 32. Pluto – a fullscreen theme for restaurants and food places… this fullscreen theme includes both dark and light skins, drag and drop homepage contents and fullscreen image galleries. 33. Rhea – is an elegant full screen theme that has cool blur menu effects, 10 page templates, password protected gallery support, 7 custom widgets, as well as audio support. 34. Simpolio – full screen theme with 7 amazing effects along with background video support. Mulisite ready with support for unlimited portfolios. 50+ Shortcodes, 8 page templates, 6 different blog templates. 35. Specere – Weird name but this theme has many impressive features including image panning, white label admin, scrollable thumbnails, social integration, sharing and is fully localized. 36. Studio Zen – Features Fullscreen slideshows with audio. Also, video fullscreen playback for Vimeo, Flash, Youtube and HTML5 videos. Fullscreen Focus view toggle clears other elements for best view of fullscreen slideshows. 37. Teardrop – features a fullscreen slider, background video support, unlimited color options, multiple portfolios and galleries and 11 page templates. Teardrop also has a featured called “Magic Portfolio” that generates layouts randomly for you which can be used for something cool. Also includes a Flickr photostream for background slideshow. 38. This Way -HTML5 and CSS3 are heavily used in this theme with tons of features including full screen sliders, audio support, video support, custom fonts, lightbox and even google maps. 39. Xebax – Xebax is Powerful Fullscreen WordPress theme that will match with any of personal, business, or portfolio site. Comes with massive admin panel options to help you manage your site more easier. 40. 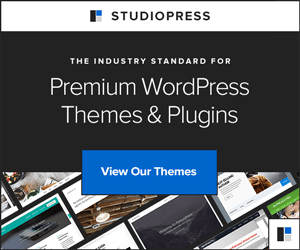 Zeus – Fullscreen Video & Image Background wordpress theme, also with a Image Slider Background. Perfect for photographers, designers, directors or companies wishing to display their work in an elegant and modern way without complications. What do you think? Have any favorite fullscreen themes? Have I forgot to list one? Let me know in the comments below. Hope you enjoyed this post! Fantastic list. Very inspirational. Thank you.